Xterra rowing machines are a good choice for those looking to get a good quality rower for under $1000. The company has made a name for themselves making solid cardio equipment full of great features and capabilities at a very affordable price. Let's take a closer look at the models they are currently offering. There are three rowing machines in the Xterra catalog, including the ERG500, ERG600 and ERG700. They range in price from $499 to $899, and all three have a functional, modern design and durable construction. The ERG500 is the base model in the series, an air resistance rowing machine with 8 different resistance levels to choose from, a heavy duty steel frame, a large performance monitor showing you all of your workout stats and a 300 lb. maximum user weight capacity. It features an aluminum slide rail, padded handle, large contoured seat, adjustable flexing pedals and an easy fold up design. 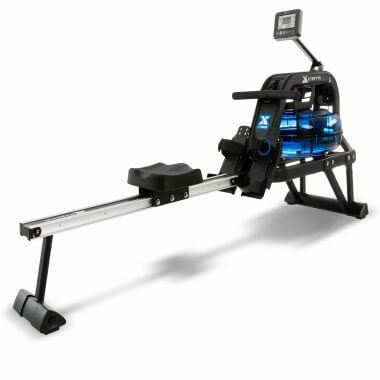 The mid-level ERG600 is a water resistance rower, similar to the new Sunny Health Obsidian Surge, with 6 resistance levels based on how much water you add to the tank, a large LCD console, and same max weight capacity as the ERG500. You also get 5 programmable modes: calories, race, time, distance and strokes, so you can pick different goals and work on improving your performance from one session to the next. 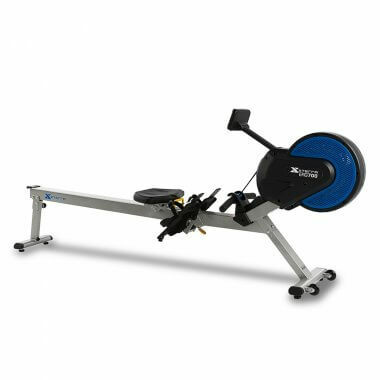 The top of the line ERG700 is an advanced version of the ERG500, with a combination of air and magnetic resistance, 16 resistance levels and 10 built in workout programs. It also has a premium console and can accommodate more weight at a max of 350 lbs. How Do Xterra Rowing Machines Compare to the Competition? Xterra is part of Dyaco International, one of the largest equipment companies in the world and manufacturer of the Spirit, Fuel and Sole rower brands. They are known for their quality and durability, and the Xterra rowing machines carry on the tradition. As far as competition, they go head to head with other players in the $500 to $1000 price range, which includes NordicTrack, ProForm, Sole, Kettler and LifeCore. Xterra definitely holds their own, and their designs definitely stand out from the competition. They always offer free shipping, have a generous 60 day money back guarantee and some of the strongest warranties in the industry. In fact, the top-end ERG700 actually has a lifetime frame warranty, something you won't find anywhere else. You also get 5 years on the parts and 1 year of in home labor. The other two models have solid warranties as well. So the Xterra rowers are definitely a good choice in this price range...it's a matter of comparing features and specs to determine which model makes the most sense for you. We're fans of the Xterra rowing machines, because they give users a very good value for their money. They are well built with strong warranties behind them, and they have a very comfortable, natural look and feel. If you prefer air/magnetic resistance, consider the base ERG500 or top of the line ERG700 if you like the idea of built in workouts. If water resistance is your thing, the ERG600 is the best option for you. All three will give you a great workout and help you reach your fitness goals, which is why you're buying a rowing machine to begin with.